Dried beans are a nutrient dense food that is often overlooked! This Homemade baked beans recipe is a great way to use dried beans = budget friendly! Plus, these are GAPS legal and a delicious real food recipe! Dried beans are a nutrient dense food that is often overlooked! Per serving dried beans are exceptionally high in the amount of protein and fiber they provide. In a book that is now out of print “Food Habits in Later Life Study”, it was found that for every 20g intake of legumes (which included dry beans), the risk ratio of death was reduced by 6% in the older people (aged 70 and older) studied! There is a big difference in the taste and look of dried beans but amazingly, the nutritional content is very similar. They are a nutritional powerhouse filled with protein, complex carbohydrates, vitamins, minerals and fiber. And, this homemade baked beans starts with dried beans! They are rich in lignans, which may play a role in preventing osteoporosis, heart disease, and certain cancers. The flavonoids in beans may help reduce heart disease and cancer risk. The plant stanol esters, or phytosterols, contained in dry beans may help reduce blood cholesterol levels. Beans are an excellent source of copper, phosphorus, manganese, magnesium and iron. While the nutritional make-up of dried beans are very similar the one exception is the iron content. White beans have almost twice the iron of black beans and kidney beans fall somewhere in between. Dried beans are also an excellent source of thiamin, folic acid, riboflavin and vitamin B6. 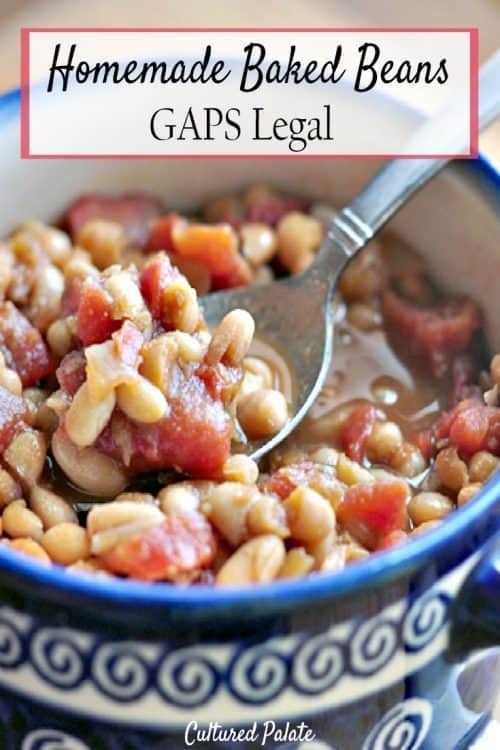 Our family really enjoys baked beans and in an attempt to find a healthy alternative to the store-bought version, I decided to use white beans because they GAPS legal, but also because they are very high in iron! Be sure to properly prepare your beans by soaking them overnight to help neutralize the phytic acid which is found in them- for more information, see Grain Preparation. If you are not on the GAPS or paleo diet, decrease the honey to 1/4 c. honey and add 1/4 c. molasses for a delicious dish. 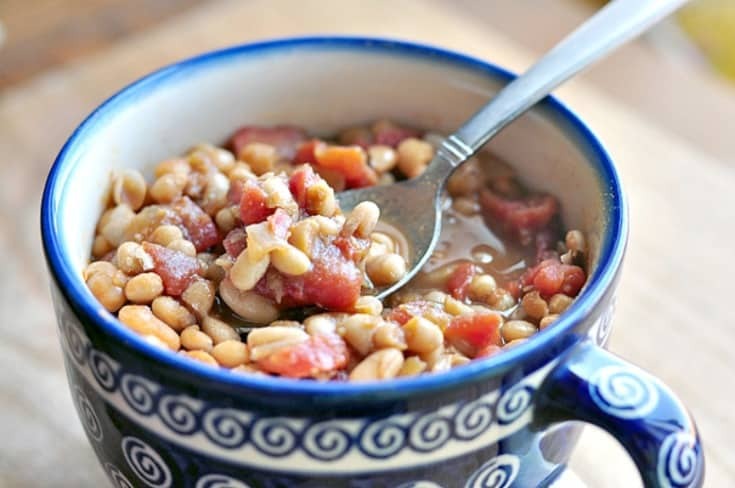 If you’ve tried this Homemade Baked Beans Recipe or any other recipe on Cultured Palate please take a minute to rate the recipe and leave a comment letting me know how you liked it. I love hearing from you! You can also FOLLOW ME on PINTEREST, FACEBOOK, INSTAGRAM, YouTube and TWITTER. Warm, comforting and satisfying - nothing compares to a bowl of homemade baked beans! Soak the beans overnight covered with water. Drain the water from the beans, cover with fresh water and bring to a boil. Cook until tender. Drain the water from the beans and add the chopped onion, tomatoes, honey, dry mustard, salt and vinegar. Cover tightly and bake at 300F for about 4 - 6 hours - until the beans reach the desired consistency. Adjust to desired sweetness. Enjoy! If you are not on the GAPS or paleo diet: use 1/4 c. honey and 1/4 c. molasses for a delicious dish. These look good. Our family loves baked beans also. What temperature do you bake them at? Sorry, Emily, I just updated the post with the 300F baking temp. 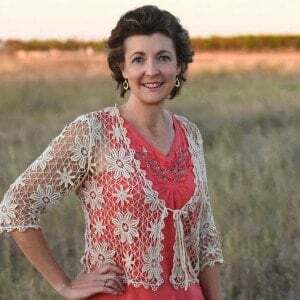 You are right, Catherine, I thought Pleasant Hill had sprouted legumes but they are only organic. Hopefully, we will have a sponsor soon to provide them but until then, just soak them at least overnight up to 24 hours. This does allow the bean to “sprout” even thought you do not actually see a sprout yet and helps neutralize the phytic acid. I do this and it is easy as well as less expensive than buying sprouted legumes. At what temperature do you bake the beans? Can you use a crock pot? Sorry about that Catherine, I have updated the post to show that you bake at 300F. I have not done them in the crock pot but it should work fine! After reading your article, I think I will not only have to eat more beans but definitely try your recipe out as well. It looks so good and tasty. Thank you for sharing this. I tried your recipe last week and thought the beans tasted awesome! some of my beans were a tad hard and the skins seemed a bit tough even after cooking for almost 8 hours though. I had to add water a couple of times too because there didn’t seem to be enough liquid. Does this maybe have to do with not soaking long enough? I had never soaked beans before so wasn’t sure if I did it right! I just put some beans in a jar and let them soak over night. When I woke up the next morning they were no longer covered with water, so I just added more until I was ready to make my beans. Or maybe I didn’t cook them on the stove long enough before putting them in the oven? That was another thing I was unsure about. The bean I tried while cooking seemed tender, but the skin was still tough. Was I supposed to cook until the whole bean was soft? Haha! I am totally new to cooking dry beans! I never knew about soaking beans, thanks so much for the tip. This recipe looks delicious!